I started my 4th (seriously, 4th?!?) 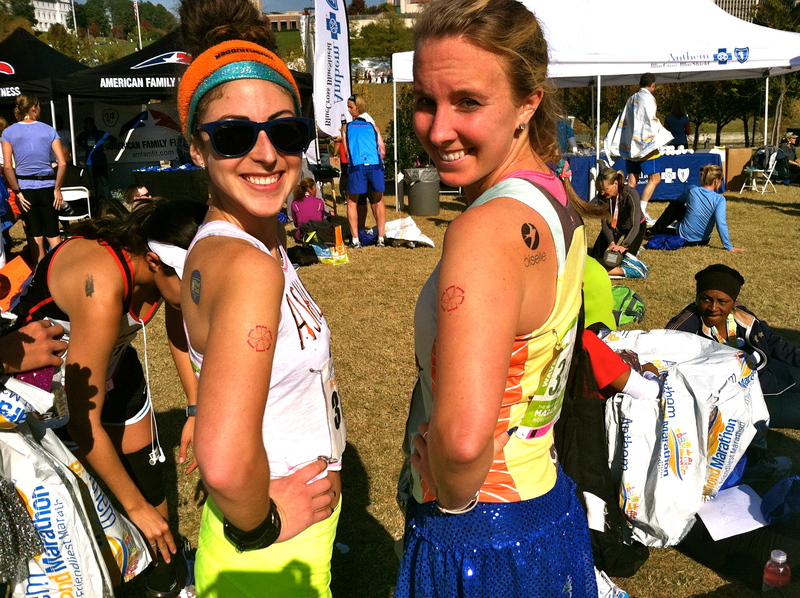 marathon decked out in my Oiselle singlet, a sparkle skirt over my Oiselle stride shorts, a Picky Bars tattoo on my right leg, a Oiselle tattoo on my left shoulder, and 5 different Believe I Am tattoos on my arms. While my look might have been described as “out of control,” I was 100% happy…and remained so until the finish line. Yep, I’m 26 years old and not 6 years old. Might be hard to believe. My first marathon was about survival. In retrospect, how I made it through a marathon when I’d been running for hardly one year is beyond me. I was very happy with a finish (in 4:09:59, for those curious). I worked a lot on my mental game before my 3rd marathon and set the goal, yet again, to BQ (now 3:35). An injury (IT band syndrome) sustained two weeks before the race threw a wrench in my plans. I ran the race anyways (it was the NYC marathon, after all), but was disappointed and, to be fairly honest, quite depressed for sometime thereafter. While my IT band healed (3-4 months total), I sort of wrote off marathons and had no desire to do one. I told myself I wouldn’t do another for a while – several years, probably. So, imagine, my surprise when a 16 mile run with Gia in September planted a marathon seed in my head. What started as a “Hey, Gia, want me to pace you for a few miles of the marathon” turned into my own NYC marathon entry by the end of the month. With a shorter, 7 week build up and prior marathon-hater experiences, my goal was to enjoy the race from start to finish. I had a time goal window of 3:35 to 3:45, but, to be truthful, wasn’t really attached to finishing in a certain time. 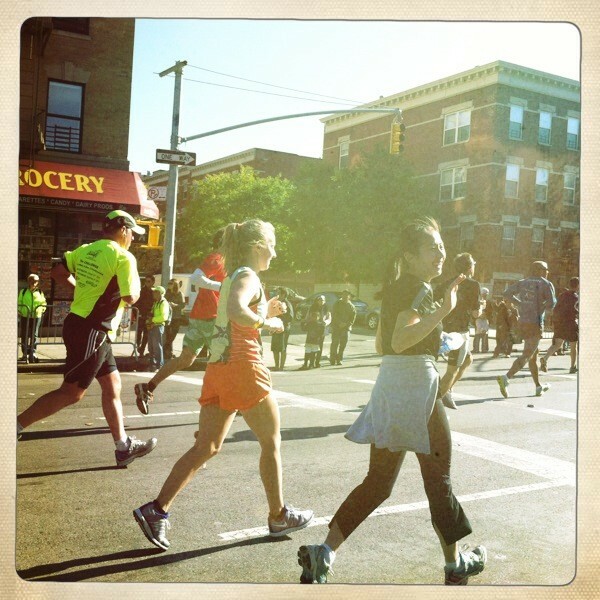 I had, yet, to enjoy a marathon and really wanted to understand what all you people out there like about the marathon. Around mile 13, Jess and I waved Gia on and, around mile 16, Jess did the same to me as she was not feeling well. 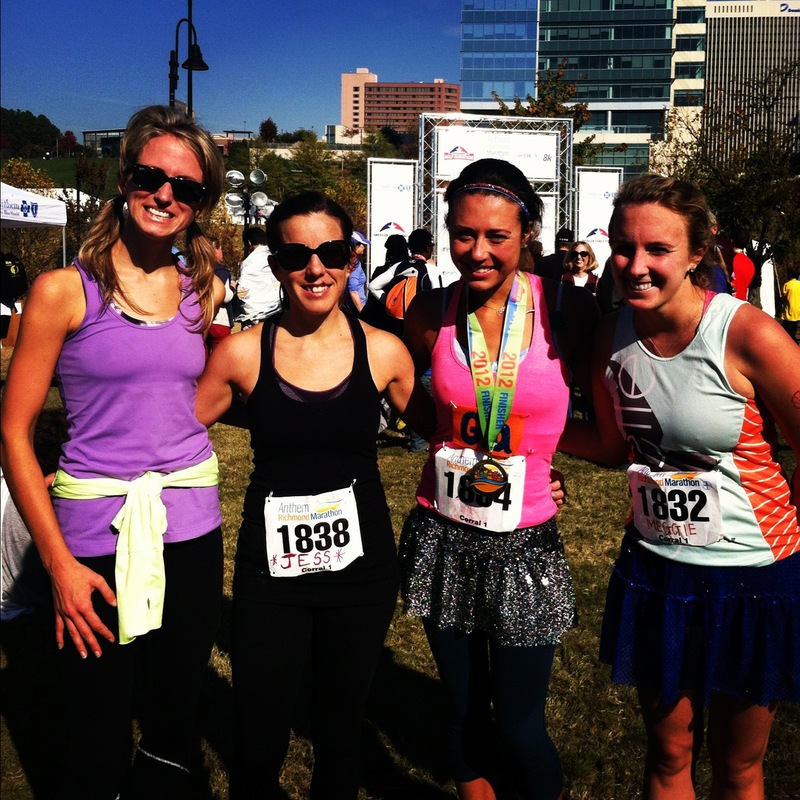 Katherine (our hostess), Jess, Gia, and I after the race. So, for the last 10 miles of the race, I ran “naked.” I think when I left Jess, I told myself, “Ok, just free, fast, and fun – its really just putting one foot in front of the other, speeding up if you feel good, and slowing down if you feel bad, nothing more complicated than that.” So, that’s what I did. Not having a watch for the last 10 miles of the race was very freeing. Even if I had had a Garmin on and knew I was running X pace when I really wanted to be running Y pace, I don;t think I could have changed gears. My legs would move as fast as my spirit wanted them to in that moment – sometimes that was faster and sometimes that was slower. Go fast (if you can). Take chances. For miles 16-20, I’d have a few minutes of good running, where I felt like I feel into a rhythm and was really strong. A few minutes later, I’d have a bad patch, but I figured that was par for the course. From 20 on, I really wanted to, truthfully, be done, but I refused to let my mind go to the finish. I focused on getting to each mile marker and that was it. 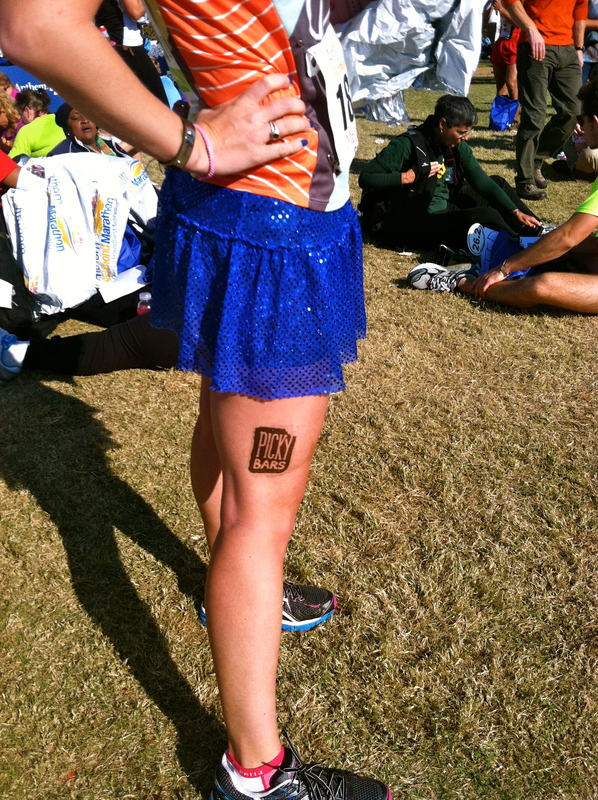 Just in case you wanted to see the Picky Bars tat. I maybe could have pushed myself those last 6 miles a bit more, but that really wasn’t my objective for the day. My goal was to get through a marathon and actually like it. From the start, I was 100% happy and at peace with whatever finish time I had so long as I had a smile on my face from beginning to end (well, you know, mostly smiling) and tried my best. Met another Oiselle runner, Stacey, at the finish. And, I sort of can’t believe I was able to do it. I mean, at mile 23 of a marathon, I was happy to be running and grateful for the experience. Usually, I HATE mile 23 (or, in the case of New Jersey, miles 13-26). In the end, I finished in 3:42:31 – a 6 min PR. I was completely, 100% fulfilled and happy at the end and, dare I say, thinking of tackling another 26.2 in the spring? TELL ME: YOUR FAVORITE RACE? WHY WAS IT YOUR FAVORITE? I must give a huge shout out to the hostess with the mostess, Katherine, for giving this displaced NYC runner an incredible weekend. From pre-race dinner to post-race daytime slumber party, it was the perfect weekend. THANK YOU! Also, you should go wish Gia (13 min PR! ), Jess, Jocelyn (big half PR! ), Ashley (1 min PR! ), Leticia (first time marathoner! ), Christy (PR! 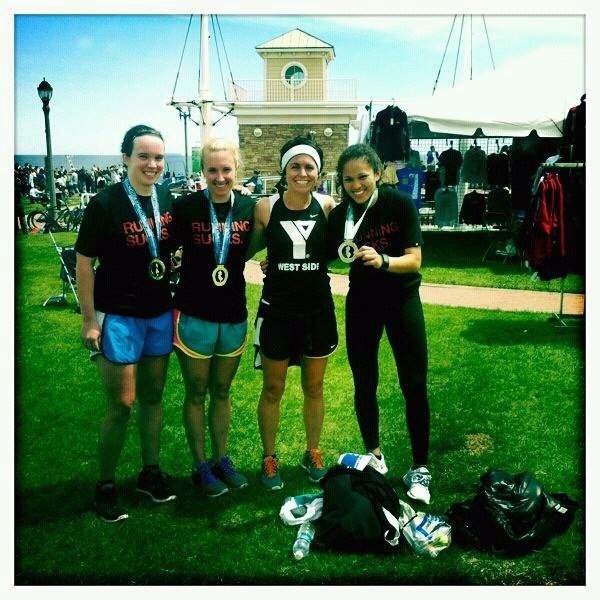 ), Christine, Fiona, Katie, and Dorothy a big congratulations on their races this weekend. try it sometime – you might surprise yourself! HUGE congrats to you Meggie! I love the report and your inner dialogue! It’s funny the things that go through our heads during a race! I have a very similar marathon story to yours and I am really hoping Eugene is the ONE where I actually love it and enjoy every minute so I can understand why people fall in love with this distance!! CONGRATS on a super fast race!! Don’t worry – before Richmond, I was like “why does everyone like the marathon, they are crazy, it is too long and torturous!” Hoping Eugene turns it around for you — with the nuun enthusiastic crew out there, I’m sure it will! Reading this race recap was like reading a good book and I couldn’t WAIT to see how it ended! isn’t it amazing what running with no expectations can do….Brings Big PR’s! nice job lady!!!! Boston is DEFINITELY in your future! Thank you – for both the kind words on my writing and your confidence in boston for me — we’ll see! Your positive, easy-going mindset definitely rubbed off on me. I admire your outlook on running. Let’s pick a race in Richmond or NYC sometime soon! I need to come back to go to Libby Hill. I am so proud of you! What a great race – no thinking, just doing! Way to go Meggie! Thank you! It has been fun chipping away at my marathon time and I have always admired how you did that and really stuck with it! Congrats, Meggie! I love your self-talk. That’s when it’s actually good to be inside your own head! I’m glad you had such an awesome race. 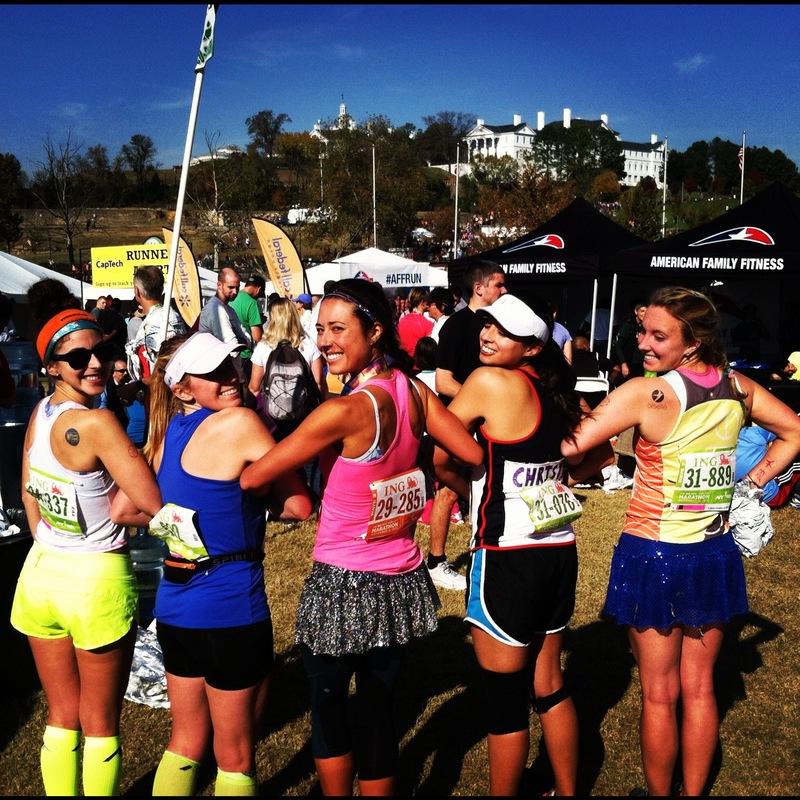 I did see you guys run by me in your sparkle skirts early on–so super cute! Great meeting you! Favorite race: last year’s Houston Marathon. I bonked in NYCM after some solid training and my hometown streets did not let me down when I committed to racing it just two months out. It’s definitely not going to happen this January, but I’m pretty sure that if I ever nab a BQ, it will be here. ha – yep, no more hating on marathons, although the 5K still holds a special place in my heart. I’ve heard great things about Houston – I’d love to run it someday! Congrats!! It sounds like you had a — dare I say — joyful time running 26.2, which is great to hear! Dare I say – you are right! It was joyful. Who knew! Congratulations Meggie! I’m not sure if I have a favorite race. In terms of fun, maybe I’d have to say that doing Reach the Beach New Hampshire this past September was loads of fun. Being part of an amazing team made it special. Thanks, Mike! I bet WSYRRC RTB was fun. Stupid school getting in my way of that! And lookie-here! PR!!! AHHHH! So awesome! Congrats Lady! All that positive thinking and talking to yourself did ya good! So happy for you and loved that you had a great race day experience. Cheers! 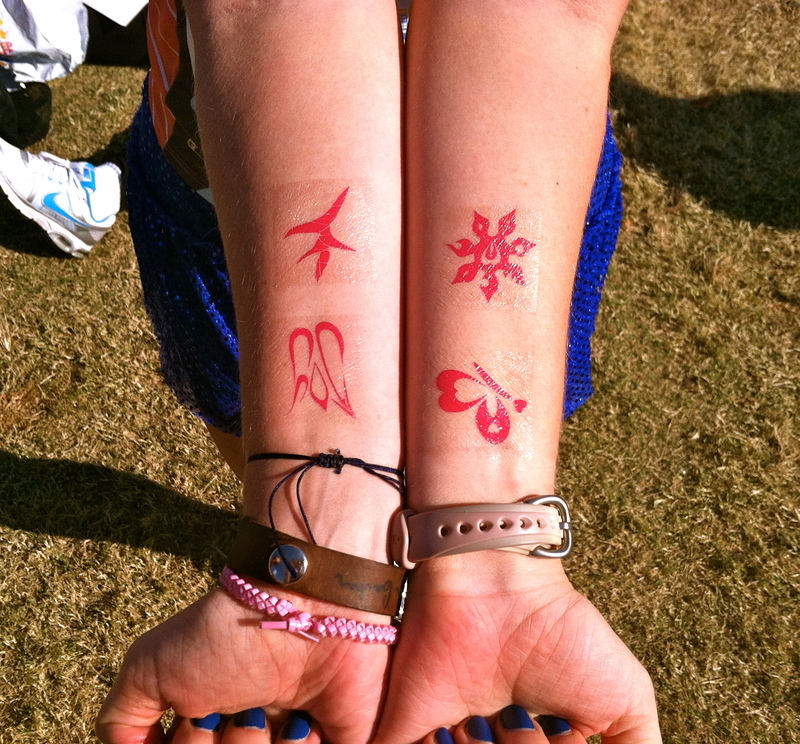 Love all the Believe I am and Osielle tattos! Quite the spirit! Sorry to hear about IT issues, I am dealing with back to back injuries and havent been running in 4 months.. I know the frustration! Great to hear you are back on track and doing great with those races! Be patient! I thought my IT band would never heal at the time I was injured. Hope you’re back up and running soon! It was so so so great to meet you this weekend! Congrats on your PR! I have to say that my favorite race was last year’s Richmond marathon since I qualified for Boston, this one was sort of the pits for me- but whatever I ran a marathon right!? Thank you so much for the picky bars and the tattoos! 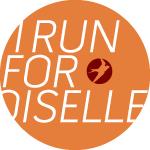 Could you email me the Oiselle girls’ email whenever you get a chance? I would love love love to apply! btypesblog@gmail.com I hope to see you again soon, I am hopefully taking a trip to New York in the next couple weeks and would love a running buddy! So wonderful to meet you, too! Hope you got my email. If not, let me know and I’ll resend. Come to NYC and race sometime! So, so so so so proud. Favorite line (in case you were wondering): From mile 22 on, my legs did feel like a puppy was eating them…” That’s normal. Marathons are mental freak shows. CONGRATS! So inspirational! Seeeee yooouuu soooon. SHERPA! Thank you. I have you to thank for boosting my confidence with that 10K this year. Let’s run together this spring. Training group forming? We will call ourselves – THE MIGHTY DUCKS! And, now, congrats to you! 16H FOR SURE! Meggie – this is SO inspiring! I really got chills reading this. I love the inner dialogue, and thank you for sharing that, because it’s a very personal thing! 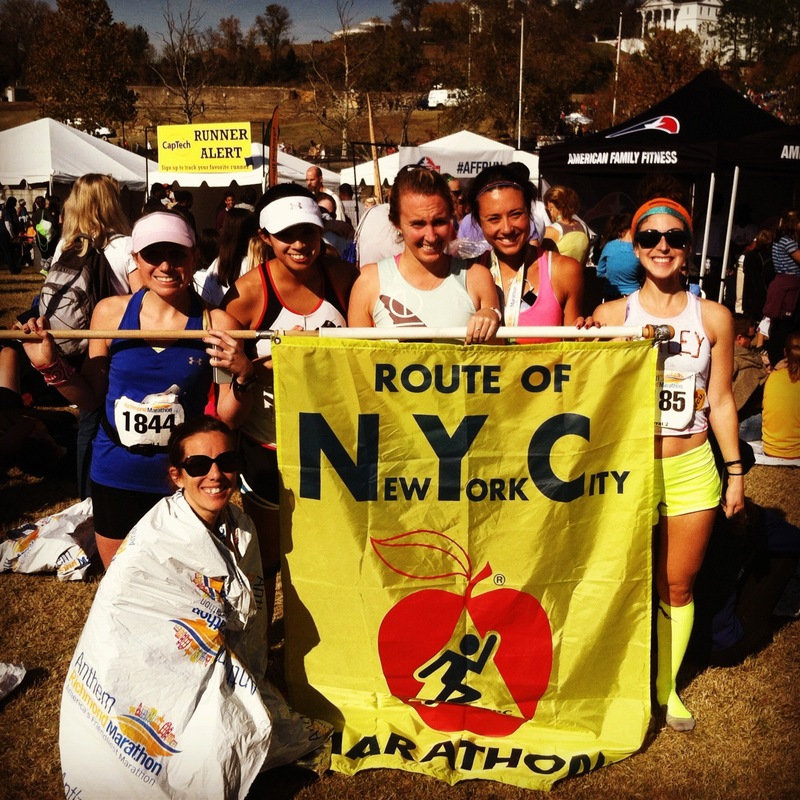 I am so happy you enjoyed yourself and PR’d on 7 weeks of marathon training! I knew you would. You rock girl! Jen – that means so much coming from an accomplished runner like you. It was, truly, one of my favorite races. Its all between the ears right? You sound completely normal to me! I love this! Welcome to the marathon obsessed club! I also think your race day outfit is perfection! I’m def wearing 7 tattoos from now on! Steal my inner thoughts all you want! 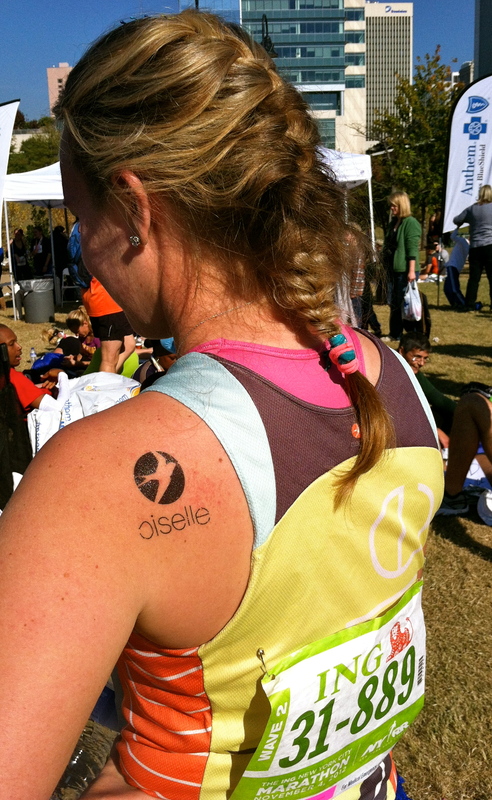 I suggest the believe i am and oiselle tats, too! 1. Can I please have your running head? 2. Can I also have your legs?! I recommend reading “Run: The Mind Body Method of Running” by Matt Fitzgerald + “Golf Is Not a Game of Perfect” + “Run Simple” by Duncan Larkin in prep for your #redemptionrace — GOOD LUCK! We are indeed, crazy, right? We just keep coming back. I don’t really get it myself. But I understood every single one of your various stories and emotional situations along the way. You are, indeed, a rock star and a great inspiration for all of us. Congratulations on your PR!!! Isn’t it great to enjoy the marathon 🙂 Have you abandoned the 5k?! My favorite race was SF. I have never felt like running was that easy in a race. Loooooooving it. 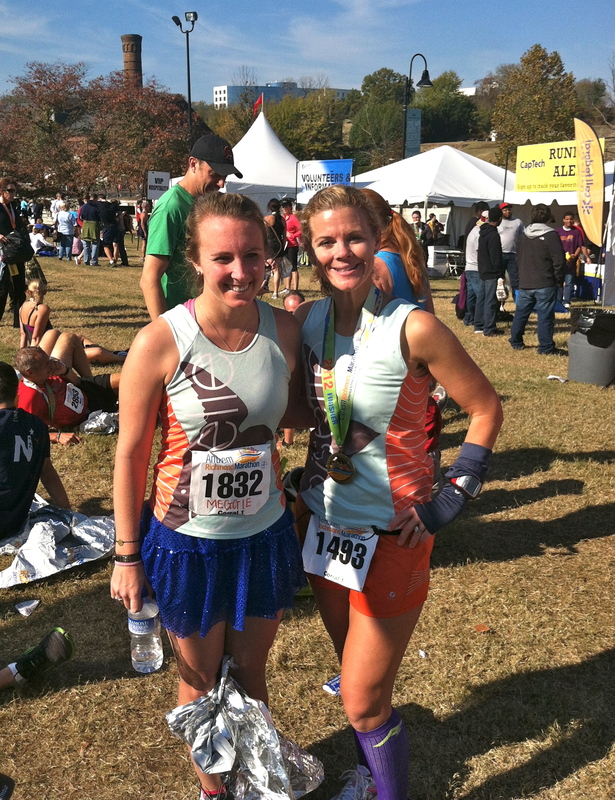 Congrats on the PR and running free…and no knee pain and screaming at it in the middle of Richmond! Spring marathon! Spring marathon! Also, you are a marketer’s dream. Indeed – I am definitely not a hard sell and if you make a cute temporary tat, I will wear it. Umm, yes to spring 26.2! Congrats – what a great race and fun post! I like your reflection on thoughts and how you felt, and it makes me think about how I’ll handle those things during CIM. looking forward to your race very soon! rock it. thank you! the best thing anyone ever did for my running was to tell me early on to ditch the garmin and learn to run by feel – our bodies aren’t stupid! i do need to get better at judging pace a bit.. Congratulations!!! So proud of your psych during this race – you really took it to the next level. It is all your psych 101 — NEXT LEVEL. Yay congrats on a PR!!! and LOVING the marathon! I hope you’re healing quick and having a wonderful week! I’m so glad I was able to figure out what people love about the marathon. Looking forward to hearing about your CIM for sure! Think you’ll blow it out of the water!